In this Left Whig version of history, the Victorian notion of Britain as ‘a beacon of progress’ is joined to the UK’s role in uniting the peoples and working class of these islands, or at of least of Great Britain. This is then projected forward in the British Left’s support for various ‘British roads to socialism’. For the Labour Left and the CPB , a key part was played by the UK in its international role in defeating German Nazism (with the emphasis sometimes as much on the ‘German’ as the ‘Nazism’). The post-1945 Labour government with its introduction of the Welfare State is also central to their thinking. Nostalgia for these days is often to the forefront of current left unionist attempts to prevent the break-up of the UK state. The period of the 1945-51 Labour governments was indeed the point at which an acceptance of the UK and ‘Britishness’ gained their widest levels of support amongst the working class. However, this Welfare State remained a social imperialist state. The Attlee Labour government intervened with British armed forces to prevent the liberation of Greece, Vietnam, Indonesia and Malaya. It made no break from British imperialist divide-and-rule. Hence it helped to leave behind the mess we still see today in India/Pakistan and Palestine/Israel. The UK also remained a social monarchist state. King George VI opened the Labour government’s Festival of Britain (which also covered Northern Ireland). Special royal crowns (five shilling pieces) were minted to celebrate the occasion. This is the political background ignored in Ken Loach’s otherwise compelling Spirit of 45. Furthermore, the Labour Left very much downplays the role of the Tony Blair and Gordon Brown led New Labour governments in dismantling this Welfare State legacy, blaming it all on Thatcher and the Tories; or arguing that New Labour was a mere historical blip, which the Left can reverse, reclaiming the party in the process. Yet it was New Labour that, in effect, handed over direct control of the economy to the City of London (Gordon Brown), introduced Foundation Hospitals to undermine the NHS (Alan Milburn), City Academies to end comprehensive education (David Blunkett), and flagged up Royal Mail privatisation (Baron Mandelson) and the ‘Bedroom Tax’ (Lord Adonis), later introduced by the Conservative/Lib-Dem coalition. Miliband’s ‘One Nation’ Labour is but an update of New Labour, and the Left is even more marginal inside the party today, with Miliband further weakening the trade union link. In Scotland, the Left could not even come up with a candidate for the last Scottish Labour leadership election. The choice was between Miliband stooge, Johann Lamont, Blairite, Ken Macintosh and UKIP-Lite, Tom Harris. It is harder and harder to find examples of where the Labour Party have promoted working class unity in Britain and the UK. Indeed, in Glasgow City Council, the Labour Party introduced semi-detached Arms Length External Organisations to run council services. This was partly to prevent any legal solidarity action by their employees. Far from uniting a British working class, Labour here has broken up the unity of workers, often working out of the same building! So, in steps the British Socialist Left. Their ‘internationalism’ is ‘proven’ by the continued existence of their own all-Britain parties/sects – with the embarrassment that this is not even orthodox Leninist policy, otherwise these would be would be all-UK organisations. Both the Labour and most of the Socialist Left attempt to defend the role of bureaucratised trade unions and the TUC. These have also been unable to provide effective working class unity in the face of the current employers’ offensive. They have sometimes contributed to disunity too. Unions at Rosyth and Devonport dockyards, both with Labour Party supporting officials, have, over a number of years, tried to compete against each other. They have sanctioned Dutch auctions of pay and conditions to save ‘their’ dockyards. The Socialist Left tends to draw upon what they see as an ‘orthodox’ Marxism. This is, in reality, an updated version of the abstract and fatalistic Marxism, which came to dominate the Second International, in the run-up to the First World War. This became just as ossified in the ‘official’ Communist Party Marxism of the Third International. This Socialist Left begins with an abstract model of capitalism. They point out that the SNP’s ‘Independence-Lite’ proposals do not threaten this capitalism. However, the British ruling class do not base their actions on such thinking. They judge each situation they confront politically. They have a shrewder understanding of the balance of class forces involved than much of the Left. From the late 1960s to the mid-1970s, in the face of mounting democratic challenges in Wales, Scotland and Northern Ireland, the British ruling class was prepared to consider liberal constitutional reform; hence the initial momentum behind Labour’s Scottish and Welsh Devolution Bills. However, during the subsequent period of mounting economic crisis, the majority of the British ruling class changed their minds, and decided to take turn their backs on any constitutional risks. They gave backing to a new Tory Right instead. In the process, some on the Left helped to bring down the 1974-79 Labour government. The SWP raised the slogan, ‘Revolution not Devolution’. Well they played their small part in the ditching of Devolution, but instead of Revolution they got Thatcher! The liberal unionist momentum for constitutional change was brought to a juddering halt. A ‘No’ vote on September 18th would give the British ruling class the same sort of boost that the defeat of the 1979 Devolution referenda gave them. In today’s political conditions of multi-faceted crisis, the British ruling class and the all the British unionist parties are just not prepared to countenance what, in the abstract, are the SNP government’s mild ‘Independence-Lite’ proposals. These could lead to the removal of a constituent nation of the UK from the control of Westminster; the prospect of even mildly social democratic measures in Scotland providing an example to counter Conservative/Lib-Dem/Labour ‘slash and burn’ austerity; the uncertainty over Trident; and the possible removal of rUK from the UN Security Council. These all represent a very real challenge to the British ruling class and the UK state. Much of the Socialist Left takes the formal appearance of constitutional politics at face value. Thus, they claim that by conceding the September 18th Independence Referendum, the Conservative/Lib-Dem coalition has democratically conceded the issue of the right to Scottish self-determination. However, any deeper examination of what is going on soon reveals that the British ruling class and its UK state do not recognise meaningful self-determination. The only reason a referendum was conceded by Cameron, egged on by Labour (Wendy Alexander – “Bring it on”! ), was because the polls showed support for Scottish independence to be around 30%. The unionist parties thought a referendum would provide them with an opportunity to see off both Scottish independence and stymie rising support for the SNP. The Edinburgh Agreement, signed by Alex Salmond for the SNP government at Holyrood and by David Cameron for the Conservative/Lib Dem coalition government at Westminster, has not led to some genuine democratic debate conducted under a political version of the ‘Queensberry Rules’. ‘Project Fear’ has only been the most visible component of the ‘No’ campaign. The blatant manipulation of senior state officials and officers, whether from the Treasury (with its close links to the City of London), or the British High Command’s plans to seize Faslane nuclear base in the event of independence, are just some of the aspects of a more hidden ‘No’ campaign, which have surfaced. Many other aspects will remain well hidden, covered up by the UK state’s Crown Powers. The SNP government’s ‘Independence-Lite’ proposals are trying to address, appease and head-off the growing popular democratic demand for self-determination. However, there are now many active groups, beyond the effective policing capabilities of the SNP front, the official ‘Yes’ campaign. The largest of these is the Left-led Radical Independence Campaign (RIC). This is another reason why, with their memory of the successful 1988-91 Anti-Poll Tax resistance, which remained beyond the control of Labour and trade union officialdom, the British ruling class, UK state, City of London and all the unionist parties are so opposed to Scotland’s independence. The British ruling class and the mainstream unionist parties do not judge any major constitutional change by its compatibility with an abstract capitalism, but by to what extent it challenges their immediate political needs. Changes have to be at their discretion and on their terms. What are the deeper politics that prevents so much of the British Socialist Left from seeing what is happening before their very eyes? Large sections fall back on a deep-seated economic reductionism. This claims the working class is only really, or mostly, concerned with economic or ‘bread and butter’ issues. They share this view with the Labour Left. This patronising view is a leftist variant of how the ruling class and their ideologues also see the working class. When workers take an interest in democratic political issues, they are thought to have been duped by others. Only the ruling class, or middle class careerists, could possibly be interested in how the state is run. When the issues of oppression and democratic struggles do come to the fore, especially over national self-determination, then the British Labour and Socialist Left tend to tail-end what they see as the most ‘progressive’ option on offer from the political representatives of the liberal wing of the ruling class (Devolution, Devolution-Plus, Devolution-Max or Federalism). This, of course, follows their view that such issues are not of direct concern to the working class. There are times and places where state repression does force the British Labour and Socialist Left to adopt a more political approach, e.g. the brutal UK state response to the Civil Rights Movement, and later the Republican Movement in Northern Ireland. However, Labour and the Socialist Left often end up pretty as much ‘Johnnie-come-latelies’, when it comes to giving support to such struggles. This is because they have downgraded democratic issues in their thinking. They only react to the more blatant cases of repression. Yet, repression arises from a situation of oppression, or the denial of democratic rights. Oppression has to be opposed. Furthermore, this is far better done, before it reaches the point of repression. There is a further problem with much of the Socialist Left’s abstract and fatalistic ‘Marxism’. If the role of democracy in the struggle against all forms of oppression often gets side-lined because of their emphasis on economic struggles, then when it comes to alienation, the third prop of capitalism, which buttresses exploitation and oppression, the Socialist Left’s shortcomings become even more marked . This can be seen historically in some of the British unionist Left’s attitudes towards minority languages. George Galloway is one example. Minority languages, such as Gaelic or Welsh are seen as backward and holding back the unity of the working class. This view is very much based on the early years of Marx and Engels thinking, which they moved on from, but which were taken on board by Karl Kautsky and the ‘orthodox’ Marxism of the Second International . The personal and social alienation involved in being forced to give up your first language, and that of your wider community is considerable. That is why it is important to recognise the alternative legacy of people like James Connolly, who adopted what was, in effect, an ‘internationalism-from-below’ approach to counter the both the state and British unionist Left’s approach to the Irish language. He wrote, “It is well to remember that nations which submit to conquest or races which abandon their language in favour of that of an oppressor do so, not because of altruistic motives, or because of the love of the brotherhood of man, but from a slavish and cringing spirit. From a spirit which cannot exist side by side with the revolutionary idea” . Following their abstract and largely propagandist approach, the British Labour and Socialist Left, can only conceive of a reactive bureaucratic ‘internationalism’ locked in a framework set by the British ruling class and its UK state. They are completely unable to conceive of an active internationalism where Socialists can take the initiative. The British Left’s defence of a British ‘internationalism from above’ (which does not even extend to the full boundaries of the UK state) represents a political dead end. This needs to be countered by an active, democratic ‘internationalism from below’. This alternative has a long tradition, going back to those English Levellers who resisted Cromwell’s attempts to send them to Ireland; the alliance of the United Irishmen, United Scotsmen and the London Corresponding Society in the 1790s; the Irish, Scottish, Welsh and English Land (and Labour) Leagues from 1879 to the 1890s (which the Socialist League briefly saw the significance of); and the emergence of John Maclean’s Scottish communist and workers’ republican alliance with the Irish revolutionary movement from 1919. When it comes to practical alternatives to supporting ‘Yes’ on September 18th, 2014, the British Left looks ahead to the Westminster General Election of 2015 instead, and the prospect of a Miliband-led Labour government. Yet, all the government options on offer at Westminster in 2015 – Conservative/UKIP, Conservative, Conservative/Lib-Dem, Labour/Lib-Dem or Labour – are committed to the same austerity politics. Shadow Chancellor, Ed Balls has promised that a future Labour government will stick to Osborne’s government spending limits. Shadow Minister for Work and Pensions, Rachel Reeves, has promised to stick to Ian Duncan Smith’s ‘welfare cap’. All potential governing parties are committed to prioritising the bankers’ pay-off, updating Trident and the never-ending circus of state promoted pomp and ceremony, including the forthcoming First World War ‘celebrations’. The unreality of the Left having any influence over the 2015 Westminster election is highlighted by George Galloway. He bases his alternative to Scottish independence on the prospect of reclaiming the Labour Party. Yet, the party won’t even let him back in, no matter how much he crawls. Meanwhile, most other Socialists and many trade unionists are moving away from Labour. Furthermore, it will not be the Left, but the Right, which will be strengthened by a ‘No’ vote on September 18th, just as it was in 1979. Some on the Socialist Left hold out the prospect of a vote for their own marginal political organisation in 2015. Once their candidates are in place, this will go along with a heated debate over the degree of support to be given to Labour, or further Left candidates, in the seats they are not contesting themselves. This may salve some consciences, but it will offer no real challenge to the existing set-up. This is why Socialists throughout these islands should support Scottish independence on September 18th 2014. Even the mildest form of Scottish self-determination being pursued by the SNP government offers the much more radical alternative of opening up wider constitutional change. Waiting for the Tweedledum and Tweedledee ‘choice’ between the existing British unionist parties offers no such prospects. However, there is no need to tailend the SNP government’s ‘Independence-Lite’ proposals. There is a significant movement beyond the official ‘Yes’ campaign. RIC is planning to extend its activity beyond September 18th, to mount a challenge over the future of the Scottish constitution. 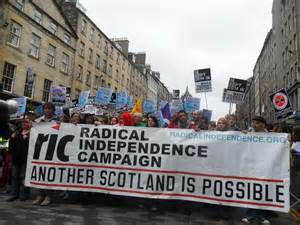 RIC is proportionally a much larger component of the wider ‘Yes’ campaign, than the few remaining Scottish Socialists and other British Left members in England are inside the ‘No’ campaign. Indeed, they are publicly almost invisible. When the constitutional future is up for grabs, this offers Socialists far greater opportunities than deciding which party or sect we should vote for at Westminster in 2015. A ‘Yes’ vote will not only weaken the UK state, but all the mainstream unionist parties that give it succour. Socialists who have been part of this process will achieve far more. For those from the old official (i.e. USSR backed) Communist Party tradition, this is supplemented by the celebration of the Communist Parties’ role in the Spanish Civil War, particularly in the International Brigades. This struggle is quite properly seen as an antecedent to the wider struggles of the Second World War. However, the intervening gap of 22 months, when the Soviet/Nazi Pact was in force, tends to be forgotten. This is dealt with in my forthcoming Internationalism from Below, volume 2, The World of Nation-States and Nationalism between the Communist League and the Early Second International (1845-1895), and volume 3, Revolutionary Social Democracy and Nation-States and Nationalism in the Age of High Imperialism and the Second International (1889-1916). I am with you in the ‘internationalism from below ‘ camp….and would describe myself as a socialist republican. I don’t normally recoil when accused of being on the far left…..an accusation normally thrown by Labour Party supporters so why would I object? I wonder though about the Far Left you refer to in your piece. It seems to be pretty all encompassing and I am unsure how anyone not in the RCN or RIC can avoid being ‘in it’. Your Far Left would once have included those ‘on the far left’ whose analysis, approach and support for the republican struggle in Ireland in the pre agreement years would not have been the same as mine….or yours. Despite that, organisations like the Anti Internment League, Irish Solidarity, TOM,….even the LCI….were not run exclusively by socialists who went on to become RCN members! I’ve always thought that the use of distance as a measure of socialist probity was a bit iffy. Alan Story has made the same point about my use of the term ‘Far Left’. I wasn’t meaning to use it in a pejorative sense, just merely descriptive. However, I think you both make a sound case for not using this term. Alan has suggested hat I use the term ‘Socialist Left’ instead, So I have modified the article above, so that wherever ‘Far Left’ appeared before, ‘Socialist Left’ is used instead.